Shinshu Roberts, co-founder/teacher of Ocean Gate Zen Center, Capitola, CA. Transmitted in the Suzuki Roshi lineage. Shinshu was ordained in 1988 and received Dharma Transmission in 2005 from Sojun Weitsman, Roshi, Abbot of the Berkeley Zen Center. She trained for 17 years at the San Francisco Zen Center holding various leadership positions during that time. She holds the appointment of Kokusaifukyoshi (International Teacher) with the Soto Zen School in Japan. Publications: Being-Time: A Practitioner’s Guide to Dōgen’s Shōbōgenzō Uji, Wisdom Publications, March 2018; “Moshan’s Mountain Summit”, Record of the Hidden Lamp: 100 Koans and Stories from 25 Centuries of Awakened Women, ed. 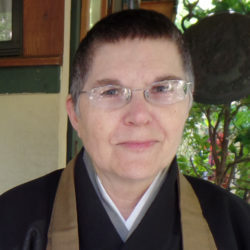 Susan Moon; “Astride the Highest Mountain: Dogen’s Being/Time”, Receiving the Marrow: Teachings on Dogen by Soto Zen Women Priests, ed. Eido Frances Carney.